The UK's £13bn aid budget cannot be used to help the British overseas territories hit by Hurricane Irma, the BBC has learned. Under international aid rules, Anguilla, Turks and Caicos and the British Virgin Islands are considered too wealthy to qualify for assistance. Instead, the UK's emergency relief will have to be funded by various budgets from across government. The government has pledged £57m so far to help with recovery efforts. The Department for International Development denied that its response to the crisis had been affected by any budgetary considerations. In a statement it said: "This is an unprecedented disaster. It is absolutely right that the UK responded immediately to the people affected. "This has been our primary focus and continues to be our priority. We are looking at how the current overseas aid rules apply to disasters such as this one." There are very strict international rules about what officially counts as foreign aid. These are agreed by the Organisation for Economic Cooperation and Development in Paris, of which Britain is a member. And these rules make clear that only the poorest countries can receive what is known as official development assistance or ODA. The OECD confirmed that Anguilla, Turks and Caicos and the British Virgin Islands do not qualify for this official aid. Their national incomes are too high. One well-placed minister told me this made it harder for the government to raise the funds needed - and he claimed five times as much money would have been available if the official pot of aid could have been used. "These millions (announced by the government) are non-ODA," he said. "Therefore they come from rather scanty resources. "This great pot of ODA, necessary for development, needs to be spent on crises like this and we have to find a way of doing it." 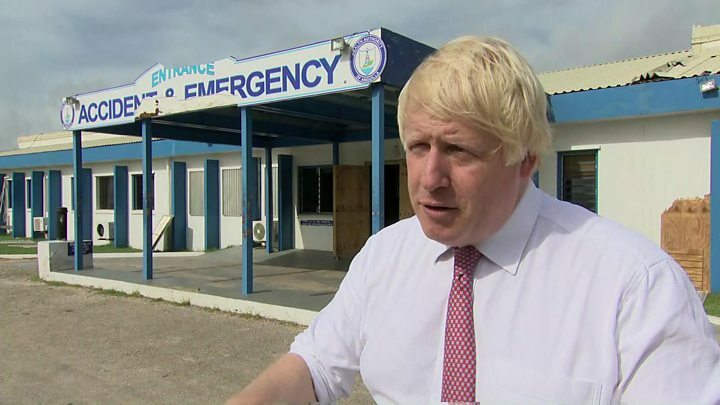 The Foreign Secretary Boris Johnson visited the British Virgin Islands and Anguilla and promised £25m more relief money - on top of the £32m already being spent in the region. Media captionBoris Johnson: "You can't but be affected by the scale of the devastation"
The Department for International Development insisted that the fact that the territories were not eligible for official development assistance had not affected the UK's emergency relief. And officials categorically denied that five times as much money would have been available if ODA could have been used. A DFID source said: "Claims that we could have provided five times as much money are absolute nonsense. These are British people on British territories and in times of crisis we stand by them. "Absolutely nothing held us back in sending help. Our response was based on need alone." The problem for the future is that a lot more money is going to be needed to help the long-term reconstruction of the three territories and that will put a huge strain on government budgets if official aid cannot be used. The MoD says it is funding its response from cross-government funds. It has also emerged that the group of charities that form the Disasters Emergency Committee are refusing to launch an emergency appeal for the three British territories. 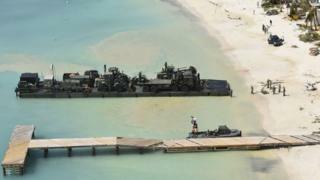 The committee said that the scale of the damage on the islands did not justify an appeal. In a statement, the DEC said: "Many of the islands that have been affected are supported by wealthy nations such as the UK, France and the US, and those governments are providing the assistance needed. "The DEC and its members have been closely monitoring poorer islands such as Haiti, but the current assessment is that the scale of the long-term damage to infrastructure and livelihoods is not at the level which justifies DEC members collectively appealing to the UK public for funds."